Simon & Garfunkel on Numbered Limited Edition 180g LP from Mobile Fidelity Pressed at RTI! Rolling Stone Named the 202nd Greatest Album of All Time! 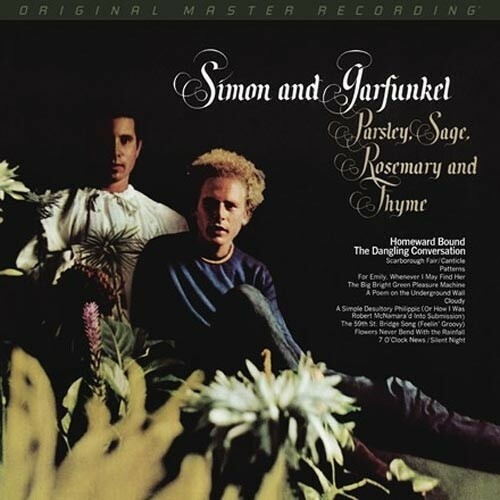 Songs for All Time: Simon and Garfunkel's Kaleidoscopic Parsley, Sage, Rosemary and Thyme Includes "Scarborough Fair/Canticle," "Homeward Bound," and "The 59th Street Bridge Song"
The liner notes pioneering writer Ralph J. Gleason penned for the back cover of Simon and Garfunkel's Parsley, Sage, Rosemary and Thyme ring as true now as they did upon the record's original release in 1966. He mused: "Today's popular music is in good shape indeed – at least the portion of it represented by this album. It has strength and it has beauty, it has lyricism, meaning and, above all, that quality of broad appeal which still retains form. And its music speaks for more than the moment. The songs in this album are songs for all time." Indeed, they are, and they can now be experienced in the highest fidelity they've ever enjoyed. Mastered on Mobile Fidelity's world-renowned mastering system and pressed at RTI, this 180g vinyl LP presents the famed duo's landmark third record in superlative sound. Reflecting the perfectionist-minded nature of Bob Johnston's meticulous production and the group's painstaking arrangements, Mobile Fidelity's reissue brings to light textures, nuances, details, and microdynamics obscured on prior editions. The hyper-realistic results give you a seat at the recording studio. The first Simon and Garfunkel set captured on an eight-track recorder, Parsley, Sage, Rosemary and Thyme here bursts with colors crucial to the scope of the songs. Separation between vocals and guitars, images of individual players, and the dimensions of the wide-spanning soundstages all flourish. Harmonies crest and seemingly float on bypassing clouds. Acoustic passages blossom with lifelike structure and tone. The intent of deliberate euphonic variations – like those between the pair's singing and Charlie O'Donnell's spoken news report on the closing "7 O'Clock News/Silent Night," which function as both poetic and social commentary – is made clearer by way of the LP's reference-caliber transparency. Such punctiliousness is exactly what the duo pursued during their four months in the studio, considered then by record-company executives to be borderline excessive. Yet there's no arguing with the end results of a benchmark work Rolling Stone named the 202nd Greatest Album of All Time. Again, it proves wise to refer again to Gleason, whose observations about Parsley, Sage, Rosemary and Thyme's character remain spot-on. "There's a delicate musical design of almost lapidarian detail. It has vitality but it is control, the sounds being made deliberately for the artist's conscious purpose," he notes, before continuing, "Take the glorious kaleidoscope of rushing feelings, blowing winds, shifting colors, bursting moods of joy and exultation in ‘Cloudy.' The song is effervescent, one is refreshed hearing it." Revitalization – and the wellspring of emotions that accompany it – endure as the most attractive aspect of Parsley, Sage, Rosemary and Thyme. Simon and Garfunkel achieve the feat time and again via interwoven harmonies, folk devices, revealing contrasts, vocal blending, spiritual imagery, and soaring melodies. The material is at once beautiful and evocative, pristine and natural, serious and joyful, pertinent and accessible. And while the individual appeal of chestnuts like "Homeward Bound," "Scarborough Fair/Canticle," "The 59th Street Bridge Song," and "For Emily, Whenever I May Find Her" remain iconic, the sum of the whole makes this 1966 masterwork a paramount expression of unbridled creativity and communal vision.